Female body hair is a much-debated topic: society demands we shave ourselves from our eyebrows downwards and women who dare to bare an unkempt body part are often deemed dirty or weird or both. Now one blogger is encouraging girls everywhere to flaunt their pits in all their glittery glory - whether they're hairy and hairless - by giving them a 2017-appropriate, Instagrammable makeover. The unofficial motto of 2017 is 'if in doubt, throw glitter at it', am I right? 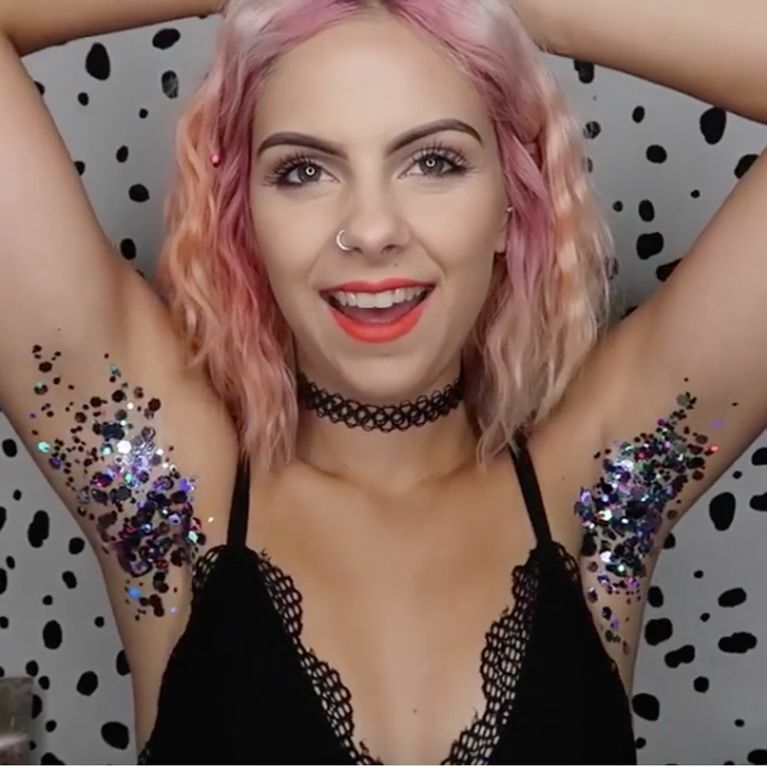 But just when you thought there wasn't possibly anything left to throw a sh*tlod of sparkle at, along comes acclaimed beauty blogger Sophie Hannah Richardson and her open invitation to join her glitter armpit party.The popular YouTuber - who boasts over 400K subscribers across her YouTube and Instagram pages - has blessed us with the perfect alternative to shaving your armpits when you 1. can't be bothered and/or 2. don't have a razor and obviously it's 100 per cent Instagrammable. Sophie's glitter-pits simply involves applying a layer of body glue to your pits before brushing them with body-specific sparkles. It's that easy which will come as great news to those who find it near-on impossible to flawlessly apply make-up, myself included. If you don't believe me, the proof's in her Instagram tutorial, shared on Monday, which has since amassed over 300K views. Reactions to the clip have been mixed with some users slamming her blatant attempt to start a viral trend while others were much more supportive, praising her efforts to celebrate the under-appreciated body part. One wrote: "LMAO who needs a Venus! Glitter armpits few," while another added: "Shall do this until I laser !!!!" This Body Confidence Campaign Gets It SO Right!